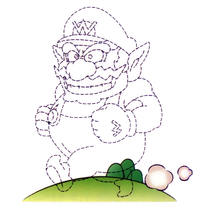 Invisible Wario is a transformation of Wario first introduced in Wario Land 3. When hit by a certain potion thrown by Mad Scienstein, he turns completely invisible, even to the player. The only way to figure out where he is the occasional cloud of dust by his feet, or the scrolling of the screen as he walks. It is needed to pass usually protected doors guarded by large eyeballs, as Wario cannot be seen. Wario can revert back to normal by going through a pipe, getting hit by an enemy attack that forces Wario to change forms, or being covered by a Teruteru. ↑ Wario Land 3 Dutch Nintendo 3DS Virtual Console digital manual, tab 11: "Transformatievaardigheden". This page was last edited on April 12, 2019, at 12:58.